I have been weaving for over 40 years and the following quotations make it plain that this became inevitable……. “…….there will always be a place for the hand worker,not as a sentimental relic……or as an escape from the present…..,but as a genuine factor in a fully contemporary life.” Written by my father in 1944. 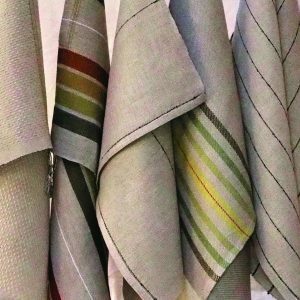 After a year at Dartington college of Arts and four years at Manchester College of Art and Design studying woven textiles I worked in industry for five years. In 1976 I set up my own workshop in Mid-Wales. Linen has been my fibre of choice since 1982 when I was introduced to the growing and processing of flax and linen weaving. This naturally led to the weaving of domestic textiles where the quality of the natural linen can be appreciated on a daily basis. 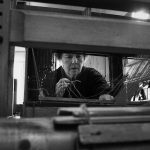 I moved to Ludlow in 1997and in 2000 was awarded a travel grant by the Thea Moorman Trust for Weavers to spend 6weeks in Sweden researching Linen.